Elections in Iran suggest a setback for conservative President Mahmoud Ahmadinejad. Friday's elections were for the powerful clerical body, the Assembly of Experts, along with local government. Moderate former President Akbar Hashemi Rafsanjani sealed a landslide win for a seat on the Assembly of Experts. With most of the results for local elections announced throughout the country, the president's allies have failed to win control of any council. 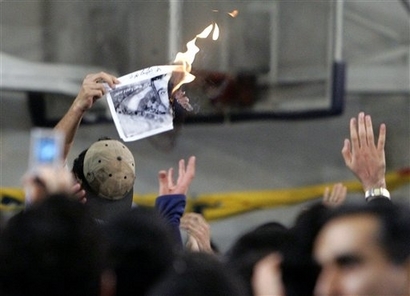 With about 20% of the Tehran votes counted, Mr Ahmadinejad's supporters were said to be in a minority. Candidates supporting moderate conservative Mayor Mohammed Bagher Qalibaf were ahead. Not a single candidate supporting the president won a seat on councils in the key cities of Shiraz, Rasht or Bandar Abbas. The president's supporters have also failed to main significant gains on the Assembly of Experts, which can dismiss the supreme leader. BBC Iran affairs analyst Sadeq Saba says the message is loud and clear and is likely to increase pressure on President Ahmadinejad to change his policies. Reformists hailed the early results. The Islamic Iran Participation Front said: "It is a big 'no' to the government's authoritarian and inefficient methods." The biggest winner, our correspondent says, is Mr Rafsanjani, who was defeated by Mr Ahmadinejad in the 2005 presidential elections. A conservative cleric close to Mr Ahmadinejad, Mohammad Taghi Mesbah Yazdi, came only sixth in the Assembly of Experts poll. The overall turnout was about 10 percentage points up on the 2002 local elections. I am not surprised to hear such reports since BBC has always been the mouthpiece for the Regime and a tool used by them to legitimize IRI!!!!! I find this picture to be amazing, not so much because I enjoy seeing Ahmadinejahds picture being burnt, but because I am so thrilled to see we have such courageous activists who can do something like this in Iran, where their very lives will be endangered. Seeing things like this makes me believe even more that the change will be coming from within, and that the student movement will be a very powerful source of this change. I personally do not agree with sending any appeals to IRI officials becasue that serves to legitimze them. I would recommand writing to human rights organizations such as Amnesty International and Human Rights Watch and asking them to support Mr. Osanlou. Iranian Kurdish journalist and human rights defender Sherko Jihani, was allowed to briefly telephone his mother and his wife on 13 December. He apparently sounded very weak, and was not able to tell them anything about his whereabouts. He is at risk of torture or ill-treatment. His family had reportedly received a phone call on 12 December from a man who claimed to be a member of the Mahabad branch intelligence services, and told them that Sherko Jihani had died of a heart attack after falling into a coma. He may have been detained for his peaceful activities in defence of the rights of Iran’s Kurdish minority, in which case Amnesty International would consider him a prisoner of conscience. Sherko Jihani was detained on 27 November in the town of Mahabad, in the north-western province of Kurdistan. He began a hunger strike in protest on 30 November, and on 4 December he began refusing to speak. Iranian Supreme leader Ayatollah Ali Khamenei has vowed that Iran would make further progress in its nuclear programme despite the objections of world powers, AFP reported. "In the nuclear energy issue, international powers insisted that Iran should not achieve this advanced technology, but Iranians unanimously insisted on obtaining this right and as a result reached a very advanced level. (I have no doubt that a lot of Iranians would want to have this advanced technology, I think our major problem is that we do not want this crazy, unstable dictatorial Regime to have access to it, because not only would that endanger Iran and Iranians but the international community as a whole). "Of course, this is not the end of the way, and the Iranian nation will make more progress in this regard," Khamanei said, without specifying what this would involve, state television reported. Iran has been locked in a standoff with Western countries over its controversial nuclear programme, which they fear could be diverted towards making nuclear weapons. The five permanent UN Security Council members plus Germany appear to be nearing an agreement on a resolution that would impose sanctions on Iran for defying international calls to freeze uranium enrichment. Enrichment lies at the centre of dispute over Iran's nuclear programme as the process can be used to make atomic weapons as well as nuclear fuel. Iran vehemently denies charges it is seeking nuclear weapons, insisting it only wants to enrich uranium for peaceful energy ends. ( There is absoloutly nothing peaceful about the IRI and there is no reason to believe this perticular activity would be peaceful, espeically with all the support IRI gives to numerous terrorist groups around the world). Iran currently has two cascades of 164 centrifuges for uranium enrichment in a plant in central Iran but plans to install 3,000 centrifuges by March. Iranian Kurdish journalist and human rights defender, Sherko Jihani, was detained on 27 November 2006 in the town of Mahabad in Kurdistan province, northwestern Iran. He is held incommunicado at an undisclosed location where he is at risk of torture or ill-treatment. He may be detained on account of his peaceful activities on behalf of the rights of Iran’s Kurdish minority, in which case Amnesty International would consider him a prisoner of conscience. Sherko Jihani, the correspondent of the Turkish news agency Euphrat in Mahabad and a member of the Human Rights Organization of Kurdistan (HROK), was reportedly summoned to appear before Branch 2 of the Revolutionary Prosecutor’s Office in Mahabad on 27 November and was immediately arrested and detained in Mahabad Central Prison. He was reportedly interrogated about forming an investigative committee to object to the kidnapping on 8 January 2006 of a woman human rights activist, Sarveh Komkar (Kamkar), and for giving interviews to foreign stations about the July 2005 killing by Iranian security forces of Kurdish activist, Showan (Shivan) Qaderi. His family was reportedly able to visit him on or around 4 December 2006. Sherko Jihani reportedly refused to pay a 50 million Rials bail (about US$ 5,500) and began a hunger strike in protest at his detention on 30 November. On 4 December, he began refusing to speak. On 6 December, Sherko Jihani was removed from Mahabad Prison and was taken to an unknown location, possibly Oromieh prison. His family has since been unable to visit him or to confirm his whereabouts. Sherko Jihani has reportedly been arrested nine times since 1999 and is said to have been tortured while in detention. As I had mentioned in my previous posts tomorow (Dec 10th) is human rights day. This is a great opportunity for all of us to remember those who have lost their freedom for the cause of human rights, freedom and democracy. Amnesty International has organized a Writeathon and there is ample opportunity to write directly to prisoners of conciense as well as their family members to show your solidarity and support. I will post some of these cases and I hope we can all put aside a few minutes of our day tomorow and write. There was unfortunately only one Iranian case on their website (Naser Zarafshan) but I did contact them and they said we could also write to the two prominent student activists Ahmad Batebi and Kianoush Sanjari. I will post each case individually withe the appropriate address and writing tips during the day. The nine men named above remain at risk of imminent execution. A further three members of Iran's Arab minority, Abdul Husain Haribi, Husain Maramazi and Husain Asakreh, have also since reportedly been sentenced to death in connection with involvement in bomb explosions. On 13 November, an Iranian local television station, Khuzestan TV, broadcast a documentary which included the “confessions” of 10 men: Abdullah Suleymani, Abdulreza Sanawati Zergani, Qasem Salamat, Mohammad Jaab Pour, Abdulamir Farjallah Jaab, Alireza Asakreh, Majed Alboghubaish, Khalaf Derhab Khudayrawi, Malek Banitamim, and a tenth man, named as Ali Motairi Nejad. The 10 men had been sentenced to death in connection with involvement in bomb explosions which took place in major cities in Khuzestan Province in 2005. Amnesty International believes this man to be Ali Matouri Zadeh, who was arrested along with his pregnant wife on 28 February 2006 (see UA 107/06, MDE 13/042/2006, 28 April 2006 and follow up). In the programme, the 10 people, said to be members of a group named Al-e Naser, (a little-known Iranian Arab militant group that is not known to have been active since the time of the Iran-Iraq war in the 1980s) "confessed" to their involvement in the bomb explosions. Unconfirmed reports suggest that the men may be executed in their home towns and villages in Khuzestan province. Following a one-day closed trial at a Revolutionary Court in Shadegan in Khuzestan province on 16 November 2006, Abdul Husain Haribi, Husain Maramazi and Husain Asakreh were reportedly sentenced to death, accused of bombing oil pipelines in Khuzestan. Amnesty International does not have any further details about their case. Much of Iran's Arab community lives in the province of Khuzestan, which borders Iraq. The province is strategically important because it is the site of much of Iran’s oil reserves, but the Arab population does not feel it has benefited as much from the oil revenue as the Persian population. Historically, the Arab community has been marginalised and discriminated against. Tension has mounted among the Arab population since April 2005, after it was alleged that the government planned to disperse the country's Arab population or to force them to relinquish their Arab identity. Hundreds were arrested and there have been reports of torture. Following bomb explosions in Ahvaz City in June and October 2005, which killed at least 14 people, and explosions at oil installations in September and October, the cycle of violence intensified, with hundreds people reportedly arrested. Further bombings on 24 January 2006, in which at least six people were killed, were followed by further mass arrests. Two men, Mehdi Nawaseri and Ali Awdeh Afrawi, were executed in public on 2 March after they were convicted of involvement in the October bombings. Their executions followed unfair trials before a Revolutionary Court during which they are believed to have been denied access to lawyers, and their "confessions", along with those of seven other men, were broadcast on television. At least 13 other Iranian Arabs are also reportedly under sentence of death, accused of involvement in the bombings, distributing material against the state, having contact with dissident organizations operating abroad, and endangering state security. Amnesty International recognizes the right and responsibility of governments to bring to justice those suspected of criminal offences, but is unconditionally opposed to the death penalty as the ultimate violation of the right to life. Please see Iran: Death Sentences appeal case – 11 Iranian Arab men facing death sentences, AI Index MDE 13/051/2006, May 2006). Today about 2000 students gathered in Tehran University to commomorade the Students Day as well as to protest against the Islamic Regime. Our students have worked long and hard risking everything they have including their lives to bring about change in Iran. Unfortunately when speaking with most Iranians abroad I find that we have become cynical to the degree where most of us have absoloutely no faith in our students and their movement. I find this to be a huge shame, especially because the student movement is alive and very strong and will not back down. I think its a shame when most of our focus is on countries such as US and people like George Bush and how they will save us from the IRI. The reality is if we do not scratch our own backs nobody will scratch it for us, and while international support is extremely important, why not also focus on the strong movement going on inside Iran and figure out how to help the student movement which I strongly believe can and will be the ultimate vehicle of change in Iran. In any event this message is in solidarity with the student movement and every single individual that is trying to bring freedom and democracy to Iran. My last post may have seemed a bit harsh, and it was not because this individual was afraid of IRI, I know many people are and for good reason. What makes me really angry is the fact that this person and many others hide behind this fear and use it as an excuse for their silence. There are many ways to help without making ones identity known to the IRI. Writing letters to the Canadian Government, contacting different human right agencies and voicing ones concern, covering ones head and face while attending demonstrations and writing under an alias name are just a few ways of helping the students in Iran without getting in contact or being found out by the IRI. So lets stop the excuses! !